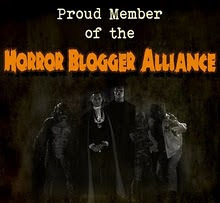 Synopsis: Brilliant young scientist Henry Frankenstein is determined to unlock the secrets of life and death. He secures cadavers for his experiments by stealing the bodies of executed criminals and by robbing graveyards. In these ghoulish activities he is aided by his hunchbacked lab assistant Fritz. 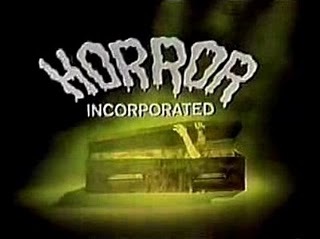 We learn that Henry hopes to give life to a body stitched together from human corpses, and he inexplicably delegates the crucial job of securing a brain to the brainless Fritz, who ends up with the brain of a criminal. Meanwhile, Henry's fiancée Elizabeth is troubled that her man has written a rambling letter to her, asking her to stay away, that his work must come first. Sensing trouble, she and Henry's friend Victor go to see Professor Waldman, Henry's former mentor at the University. Waldman tells them that Henry's experiments had crossed all the boundaries of ethical behavior and reason. His demands for a limitless supply of human cadavers were too much for the University to provide; for this reason Henry decamped to a new location where he could make his own rules. Elizabeth convinces Waldman to join her and Victor in trying to convince Henry to come home. The trio happen to arrive at Frankenstein's lab just as Henry is using lightning to imbue his stitched-together corpse with the spark of life. They are fascinated, though horrified, when Henry succeeds. Later, Waldman warns Henry that no good can come of this creation, and we see the creature for the first time. It is huge and ungainly, but seems strangely innocent. Fritz whips the creature and torments it with fire. Eventually the creature strikes back and Fritz is killed. Convinced now that the monster must be destroyed, Henry allows himself to be taken back to his ancestral home, and leaves it to Dr. Waldman to dispose of the creature. Comments: For all the similarities between Dracula and Frankenstein -- two smash horror hits released months apart by the same studio, sharing some of the same cast -- the two movies are quite different. For most of its running time Dracula comes off like the stage play it was based upon. 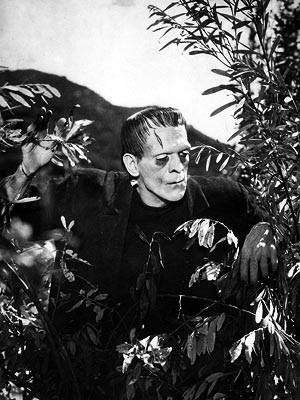 Frankenstein, by contrast, seems altogether more lively and innovative. The camera work and set design recall the German expressionist films of the 1920s, and the production as a whole seems unhindered by the clumsy sound-recording devices of the time. The performances here, too, rise above those of Dracula, though they are still uneven; Colin Clive is simply dreadful as Henry, all tremulous shouts and broad stagey mannerisms; Dwight Frye's Fritz is a bit one-dimensional, though that is more the fault of the script than Frye's performance (though seeing it this time I'm struck by how young the guy looks). Mae Clarke brings some badly-needed charm as Elizabeth, thinly-written as her part is. And my advice to anyone who remembers Boris Karloff's performance as a lot of stumbling around and grunting ought to see this movie again. Through a lot of make-up and prosthetics Karloff somehow manages to project a combination of child-like vulnerability and feral savagery. It's really an extremely subtle and well thought-out performance. Much is made of the fact that Frankenstein departed greatly from Mary Shelley's novel, and this is true. But the central theme of the novel -- responsibility for one's actions -- remains intact. Henry builds his monster without a thought as to the consequences for Elizabeth, the creature, or the community at large. Thus he brags about his great accomplishment while it is being abused in the cellar by Fritz; when he consents to destroy the creature, he does not do it himself, instead leaving the task to Dr. Waldman. If I have any complaint about the movie it is that the screenwriters let Henry off too easily; we see him being nursed back to health by Elizabeth in the final scene, and it is made clear that a wedding will be taking place soon, after which we can only assume that Henry and Elizabeth will get busy making new life the old-fashioned way. That, as the kids used to say, is a cop-out. Elizabeth should probably think twice about marrying a nutty recluse who likes to sew together corpses that he just dug up in the graveyard. Come on, Elizabeth. You're a knockout, honey. You can do better. FRANKENSTEIN was Chilly Billy's debut broadcast from the Universal era, becoming the all time champion during its 20 years on the air- 14 times, 2 more than runner up DRACULA. 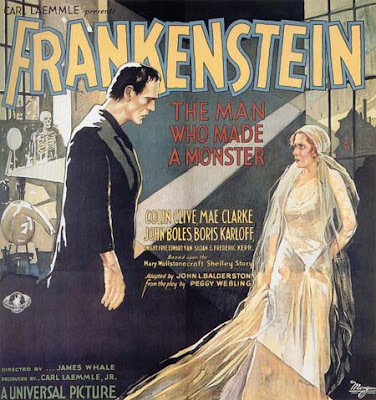 Thus began the longest and best remembered horror series from Hollywood's Golden Age, but none of it would have been possible had it not been for director James Whale, and his insightful choice for The Monster, Boris Karloff, whose career encompassed over 20 sound titles already, as well as 57 silent films. I prefer the 1931 original over what many understandably believe to be superior, the 1935 sequel BRIDE OF FRANKENSTEIN.